« Russia expands blitz, Ukraine drawn in. In what seems to be a steady stream of breaking news a new story has developed. The Red area is land no longer under Georgian control. The Orange is occupied or disputed Georgian territory. This is an approximation since information is difficult to acquire in a war zone. The United States State Department has evacuated over 170 Americans from the Republic of Georgia as news of the Russian occupation of Gori spread. Two different convoys have left Tbilisi with 170 Americans along with their family members on their way to Armenia. The United States is sending in more convoys in order to remove any other Americans from the war zone. The Russian military is citing the takeover of Gori as a way to prevent attacks from Georgia into South Ossetia. Gori is a key Georgian city on the way to the capital of Tbilisi. The Russian’s have denied having Russian troops on the ground in Gori, however eyewitness accounts differ. Georgia is calling for an unconditional cease fire in the face of a Russian onslaught. Saakashvili claimed Russia had 500 tanks and 25,000 troops inside Georgia. A Russian defense ministry said only four planes had been lost. The Russians have opened up their second front full force capturing key western cities and devastating port towns. It seems the question I previously asked has been answered for us. 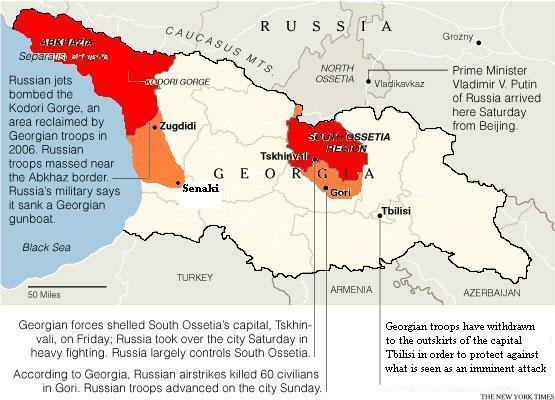 Russia is moving in towards Georgia itself and attempting to take out Tbilisi. Russia has said it has no intention of taking out Tbilisi. Only time will tell what is going to happen. What I can say is that the Georgians are reinforcing and digging into areas around Tbilisi preparing for what is seen as an inevitable invasion. This is due to help by the United States, in flying 2,000 Georgian troops out of Iraq and into Georgia at the request of Georgia. This entry was posted on August 11, 2008 at 2:03 pm and is filed under Asia, Europe, International News, War. You can subscribe via RSS 2.0 feed to this post's comments.